The Razor shell clam are from the Galician Rías, famous coves along the coast. 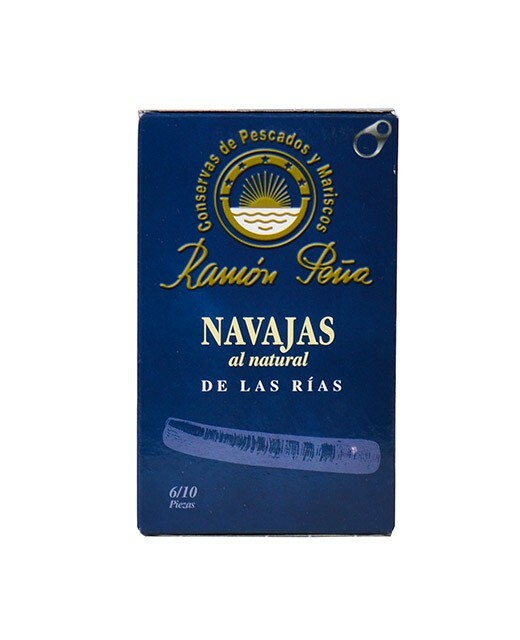 Ramón Peña selects the best products (large fish), before cleaning and removing the sand remained in the razor shell clam. The Razor shell clam are then baked, and then the shell is removed before canning. You can taste it as an aperitif with lemon juice fillet, fried or au gratin with some vegetables. Razor shell clam (molluscs), water, salt. José Peña Oubiña created in Cambados, in Galicia, a small factory of canned fish and seafood in 1920. His philosophy was to always look for the best quality, and this way of thinking led him to success. Three generations later, Ramon Peña still follows this way of thinking to the letter. In order to obtain such a high level of quality there is no room for average, and everything has to be right on the spot. Ramon Peña selects the best fish and seafood himself, with the same strictness as he uses when it comes to choosing his associates. He only uses the very best raw products, and he elaborates his cans using a traditional process, sticking to his exclusive and original recipes.